Humans have changed the face of the Earth by significantly altering the natural movements of chemicals on the planet’s surface, according to a new study by geochemists at Woods Hole Oceanographic Institution (WHOI). The scientists analyzed how 77 different elements were transferred between rock, soil, and water via natural processes (such as volcanic eruptions, plant growth, and erosion) versus human activities (such as mining, agriculture, and construction). They concluded that the movement of up to 62 of the elements was dominated by things people are doing. The comprehensive inventory of how elements circulate on Earth’s surface demonstrates how severely humans have influenced our planet’s chemistry, said WHOI geochemists Indra Sen and Bernhard Peucker-Ehrenbrink. It adds evidence to support the suggestion to adopt “Anthropocene” as an official term to define a new geological epoch in which humankind is reshaping the planet, the scientists wrote in the July 2012 issue of Environmental Science & Technology. Sen and Peucker-Ehrenbrink tracked a remarkable amount of industrial and scientific data for their study. 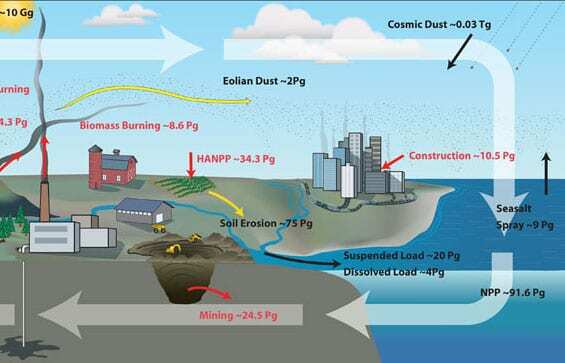 For example, they investigated natural processes such as winds, which sweep away 2 billion tons of chemical-rich dust annually, and rivers, which discharge 4 billion tons of dissolved compounds to the sea each year. And they identified often-overlooked details. For example, previous studies estimated the amount of sediments that rivers transport by measuring how much is discharged into the oceans. But Sen and Peucker-Ehrenbrink estimated that nearly four times as much soils and sediments is mobilized by rivers but not accounted for in the discharge—because they are deposited downstream or trapped behind dams before ever reaching the sea. The scientists also included several processes ignored in previous studies but that turned out to be significant. For example, 30,000 metric tons of cosmic dust lands on Earth every year, providing small but important amounts of osmium and iridium to Earth’s surface. To assess human activities, they compiled statistics on such things as global coal and petroleum production (from the U.S. Department of Energy) and worldwide mining for minerals, ranging from aluminum to zirconium (from the U.S. Geological Survey). Once again, they took a closer look at the geology of ores and current industrial practices and concluded that the amount of material and number of elements that have been mobilized by humans have been hugely underestimated, because only the end product is counted in official production statistics. Up to 95 percent of some metals, along with many other minerals, can be incinerated or discarded in industrial processes that produce a pure product. By factoring in such details, Sen and Peucker-Ehrenbrink produced far more accurate estimates than previously available. They also factored in for the first time a broader range of human activities that transport elements, including the massive movement of earth during the construction of houses, roads, and even manmade islands. Through mining and construction, humans move an estimated 35 billion tons of sediment and rock each year. 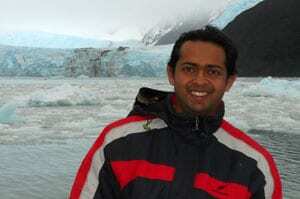 The scientists also took a closer look at how human activities are influencing natural processes. Farming, for example, accounts for a portion of the total amount of chemical compounds that cycle between air, soil, and vegetation as plants grow and decompose. 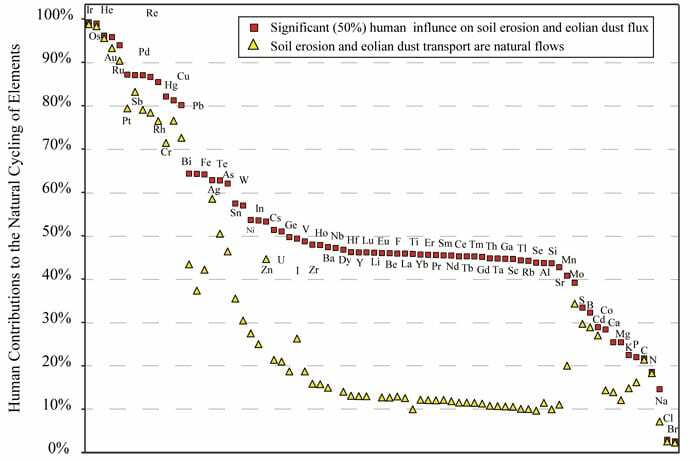 Sen and Peucker-Ehrenbrink also concluded that changing human land use, particularly deforestation, has caused erosion and the transport of dust, and thereby intensified the movement of elements. To make their estimates, the scientists could not obtain complete information about all the elements and could not escape making assumptions. To account for their assumptions, they used statistical models to place most likely ranges around each estimate of the elements’ movements via human and natural processes. Mining has overwhelmingly disturbed the natural cycling of such metals as gold, silver, and platinum, along with the closely related platinum-group metals (ruthenium, rhodium, palladium, osmium, iridium), which have several chemical applications, including in the catalytic converters that neutralize noxious compounds in car exhaust. Humans have disturbed the natural cycles of rare earth elements over a relatively short time because of the explosion of technological applications that require them. Elements such as yttrium, neodymium, and europium are used to illuminate TV screens, recharge the billions of batteries in cell phones and laptops, and power alternative energy sources by driving the high-powered magnets used in wind turbines. Nature still dominates the cycles of carbon, nitrogen and phosphorus, which are chemical building blocks of all living organisms. However, widespread human activities such as using fertilizers on farms, lawns, and golf courses and burning fossil fuels are redistributing these elements on Earth’s surface in ways that have far-reaching consequences on people and the environment. Excess nitrogen and phosphorus from fertilizers and septic systems can overfertilize coastal waters and cause eutrophication and dead zones. Rising carbon dioxide levels in the atmosphere from fossil fuel burning are trapping heat and raising global temperatures. 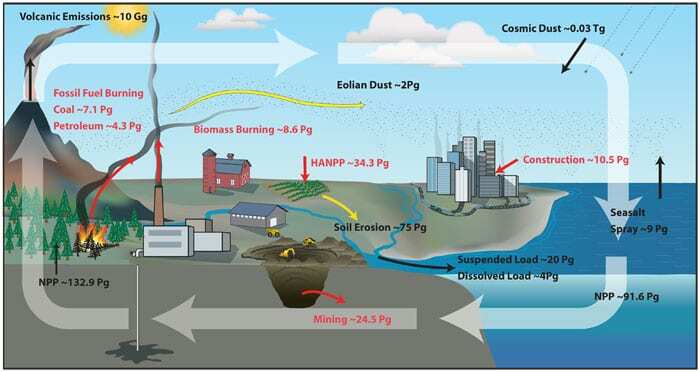 Activities such as burning coal and manufacturing cement mobilize toxic metals such as mercury and lead into soils where we grow our food or the waters where we fish; a small amount of human mobilization, sustained over time, can have major consequences for human health. 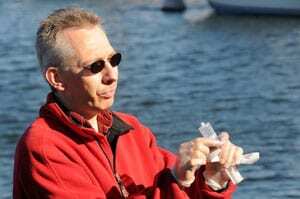 This research was supported by a WHOI postdoctoral scholarship to Sen and a WHOI Coastal Ocean Institute fellowship to Peucker-Ehrenbrink.